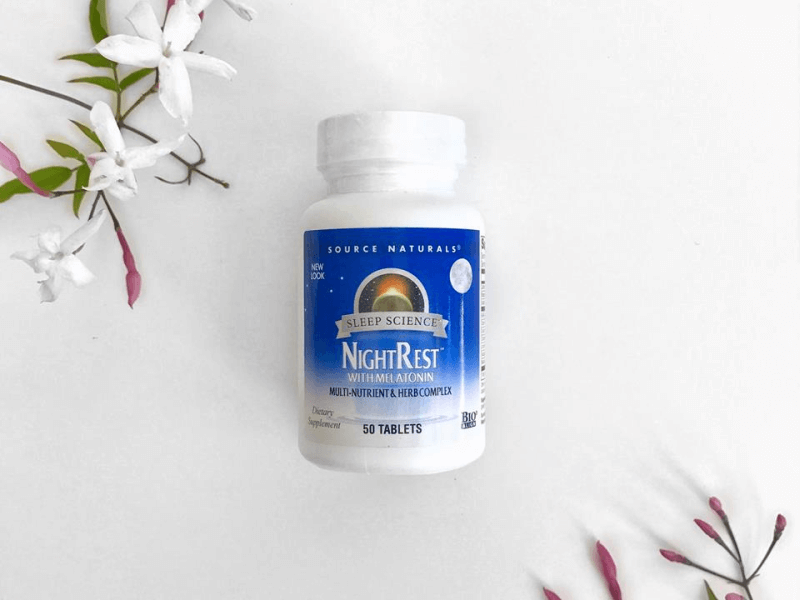 The high Melatonin content and the lack of a money back guarantee may dissuade some, but there's no denying that Source Naturals NightRest is one of the most tried and tested natural sleep aids out there. It's particularly recommended for people sensitive to Valerian Root, as its formulation does not contain the popular sedative herb. Unlike many of the sleep aids we’ve reviewed, Source Naturals NightRest is not from a relatively new startup, nor is it an old company looking to dip its toes into the vitamins and supplements market. Threshold Enterprises, which created the Source Naturals brand in 1982, was itself founded in 1978. This brand ended up being one of the pioneers of the health and wellness dietary support supplement industry; while the development nutritional blends in daily dosage form is a huge market now, then it was little more than an idea. Threshold Enterprises, through Source Naturals and their other properties, expanded on that idea with the intention to empower people to step up and take responsibility for their health and wellness. Today, Threshold Enterprises distributes over 350 brands; and continues to maintain and manufacture Source Naturals, products of which are sold both online and in over 6,000 physical stores all across the US. We chose to review Source Naturals NightRest among all of these other options as it is a good balance between simple and complicated: no flavor or dosage options; still a Melatonin-based blend as opposed to a single-ingredient supplement, though not too complex; and a good contrast to previously reviewed products, as it doesn’t contain all the usual components and even utilizes one or two uncommon ones. Additionally, Source Naturals calls it their premier nighttime sleep formulation. 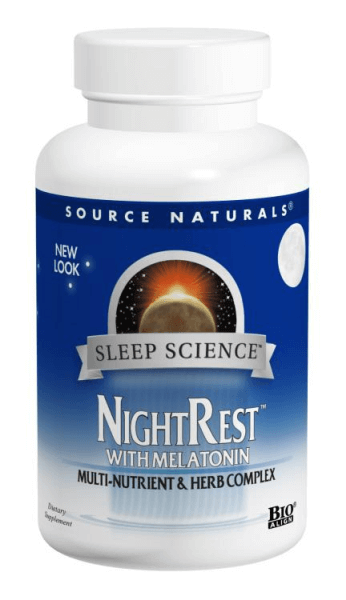 As far as Melatonin-based, multi-nutrient and herb blended sleep aids go, one of the most established in the industry is Source Naturals Night Rest—now also called Source Naturals Sleep Science Night Rest, because it’s been put into a trademarked line of products that all target sleep problems. 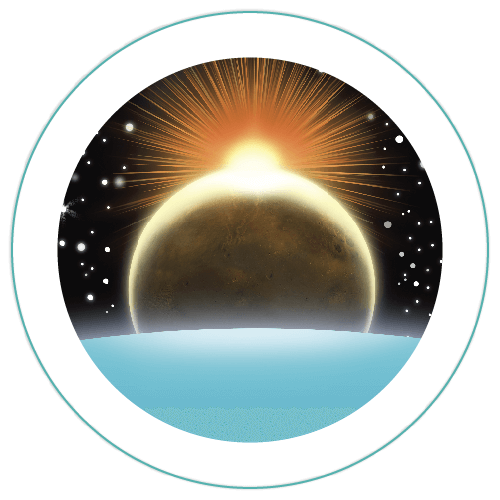 NightRest in particular is marketed as a unique but still comprehensive and potent formulation that is a combination of cutting-edge technology and traditional herbal medicine. It sends sleep and relaxation support to multiple systems in the body—from the brain and nervous system, to the muscoloskeletal system, and especially hormonal functions and mental stress responses—resulting in quicker sleep onset and a restful slumber. Of note are two things: the absence of Valerian Root and the presence of some amino acids that are not often found in sleep aid supplements. The great thing about Source Naturals is the abundance of information available on the official website; extending from literature about formulations, to health and wellness posts that aim to educate and propagate healthier habits. However, do not let this replace going to an actual healthcare profession—preferably one that is familiar with you and your medical history. Trusted, well-tested and well-researched products like Source Naturals NightRest may still cause unintended side effects; going to a doctor to talk about the possibilities gives you that extra little bit of insight and preparation if the worst should happen. While it’s probably not going to be fatal, problems like bad drug interactions or undesirable changes in existing medical conditions can arise. Source Naturals NightRest is made up of a blend of amino acids and plant extracts, supported by a foundation of a hormone and a mineral: Melatonin and Magnesium. Let’s look at each ingredient separately to further understand why Source Naturals calls this one of their premier sleep aids. First, there’s Melatonin—and a lot of it. As a naturally occurring human hormone and antioxidant, it is used by the body to regulate your sleep-wake cycle. NightRest puts more Melatonin in a dose the most of its industry counterparts—5 mg in one dose instead of the typical 1-3 mg in non-“extra strength” variants—and while this may sound like a good idea overall, there are studies that show higher doses to be just as or sometimes less efficient than the typical amount. Fortunately each Source Naturals NightRest dose is served as two tablets; so you and your doctor can potentially work out a smaller serving fit for you, should you be sensitive to the higher dose. There’s 300 mg of Magnesium, which is just on the low end of the Recommended Daily Allowance (RDA) of 300 mg to 400 mg for adults. This can potentially be a cause for concern if your diet includes many Magnesium-rich food items already; like leafy greens, fish, whole grains, nuts, seeds, yogurt and more. Too much can result in irregular heartbeat, lowered blood pressure and slowed breathing; and other more worrying symptoms. Magnesium is added to sleep aids because it helps calm nerves, relax muscles, and is important in maintaining healthy GABA activity—which we will get to in a moment. Amino acids in this formulation are GABA, Glycine, and Taurine. When it comes amino acids, GABA is the most often used in sleep aids—among the three enumerated, that is. It is no stranger to the human body, although it can be found elsewhere, like in certain fermented food. It reduces activity in some brain cells, which in turn relieves anxiety and initiates a sedative effect. Curiously, it is often paired with amino acids L-Theanine or 5-HTP. In Source Naturals NightRest, it works particularly well with fellow amino acid Taurine, which activates GABA receptors in the brain. Glycine, on the other hand, is said to prolong REM stages of sleep and prevent sleep fragmentation. Finally, the plant-derived extracts: Chamomile, Lemon Balm and Skullcap. Chamomile and Lemon Balm are constant companions; we’ve seen them in tandem in other formulations, like ORB Sleep Complex or Vitafusion Melatonin. Both are gentle, calming and relaxing; with the added benefit of being familiar to most people, as they are commonly taken as tea. Skullcap, on the other hand, is very unusual—similar to Glycine, it’s not often seen in popular and commercially available melatonin-based dietary supplements for sleep support. A North American native plant with deep folk medicine roots and a slew of studies to support its medical use, Skullcap has long been known to be a mild sedative and anticonvulsant, as well as a remedy for bouts of anxiety. Vegetarians and people with many food sensitivities will be happy to know that Source Naturals NightRest is more than likely suitable for their use. The dietary supplement doesn’t contain corn, dairy, egg, gluten, soy, sugar, preservatives, or wheat; nor is it enhanced with artificial color, flavors or fragrances. Source Naturals limits the maximum dosage to two tablets—30 to 60 minutes going to bed—though you can take only one if you’re worried about the Magnesium and Melatonin levels. The company is very firm about no exceeding this dose, as well as not using the product when it’s not the appropriate time; likely because of its strong effect. They also warn against taking the supplement with alcohol; as well as driving or operating machines right after dosing. As with most sleep aids, it’s not advisable to use if you are under pregnant, breastfeeding or trying to conceive. Children and teenagers are also advised against using Source Naturals NightRest. Potential customers are urged to consult their doctors first—especially if they are suffering from diabetes, depressive disorders, epilepsy, or other medical conditions that may be affected negatively. Because Source Naturals has such a wide selection of sleep aids, it may be worth looking into them to possibly find of that it the best fit for you. By reviewing Source Naturals NightRest we are no means saying that it is the best out of what the company manufactures. For example, if you want to avoid Melatonin, you can choose a product that doesn’t have it. If you would prefer a flavored product or something in liquid or lozenge form—especially because some verified purchasers have complained about the size of the tablets—Source Naturals also offers these options. Source Naturals does not specifically talk about this on their official website. The literature available is meant to extol the virtues of their products, obviously; and because of the multitude of brands and items Source Naturals makes, it is difficult to consolidate all their customer concerns into an easily searchable FAQ or help center. That being said, as a product that’s not exactly new, there are hundreds of customer reviews online that you can check. Here are some common side effects mentioned: great sleep onset, worse sleep interruptions; vivid, sometimes unpleasant dreams; and morning grogginess. Overall, very common mild side effects that vary from person to person; though it should be noted that the overwhelming response does not note anything but the fact that the product works perfectly. How Easy Is It to Purchase Online? Source Naturals NightRest is available on Amazon and health-focused websites like GNC, iHerb, the Vitamin Shoppe and more. There official website, while devoid of an online store, has an easy to use store locator that you can use by putting in your zip code; should you want to buy the product in a physical store in your area. Source Naturals has over thirty years of experience in the dietary supplement industry; and its parent company, Threshold Enterprises, even more so. The makers of Source Naturals NightRest have a long track record of being innovative but will putting the well-being of their customers first. The approach of combining the best of both cutting edge science and technology with traditional folk medicine and knowledge is not a unique idea—in fact, many dietary supplement makers work with the same philosophy—but it’s important to remember that Source Naturals is a veritable pioneer when it comes to this. Their products were born out of that two-pronged approach before it was mainstream and commonplace. They’re also a company with a conscience, it seems. Like Nested Naturals, Source Naturals is partnered with Vitamin Angels; a non-profit organization with global scope, providing vitamins to mothers and children suffering from malnutrition. How Is Its Quality Assured? Source Naturals verifies the authenticity and quality of their raw materials; and after manufacturing, each batch of products is tested to make sure the label matches the contents before it is finally packaged. Because they do their own manufacturing, they are able to keep an eye on the entire process—from procuring the raw ingredients, to the development of the formulation, to stringent testing for purity and possible contamination. The content on the official website about Source Naturals’ quality assurance strategies and standards isn’t as details as those of others, but it is sufficient. For more information about this, it’s easy enough to contact them directly—which we will get to in a bit. How Effective Is It, Really? The negative opinions are few and far between. Of the hundreds of customer reviews we looked at online, few were truly negative—at most, they said that the product didn’t work for them, or worked imperfectly. There are quite a number of people that noted its potency when it comes to inducing sleep; but that the need to sleep passes if you don’t actively try and fall asleep during a short window of time after you dose. Other people reported that they slept soundly for a few hours, and then woke up but couldn’t get back to sleep. These all point to an imbalance; perhaps for these people, supplements that tackle sleep quality and sleep duration would be better. How Is Customer Support? Is There a Return Policy or a Guarantee? Customer Support is average. There is an email contact form on the official website, as well as multiple telephone numbers and an address listed. Source Naturals also maintains an active social media presence; particularly on Facebook, where their page hosts regular giveaways and community discussions. However, very noticeable is the fact that their customer service doesn’t go the extra mile and interact with people reviewing their products on sites like Amazon. Also: no return policy or guarantee. Visit Amazon & Find Source Naturals NightRest Deals Now! 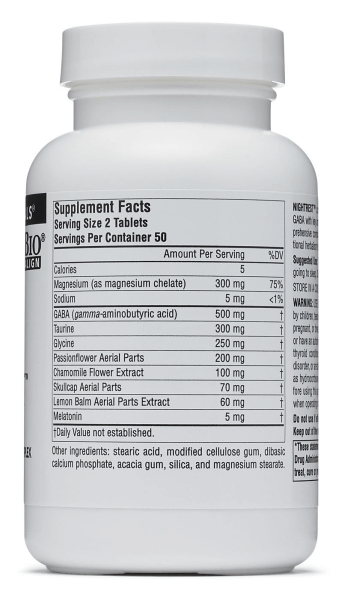 Source Naturals NightRest comes in bottles that hold 50, 100, or 200 tablets. Here are the lowest prices available as of this writing: $17.54 for a pack of two 50-count bottles on Amazon, $17.20 for one 100-count bottle on GNC, $12.26 for one 100-count bottle on iHerb, and $18.39 for one 100-count bottle on the Vitamin Shoppe. Without a built-in return policy or guarantee and a lackluster showing when it comes to customer support, we would normally be inclined to dismiss this product. However, the price point and the fact that you can choose to take one or two capsules to control your dosage are very compelling reasons to just try it. Not to mention that fact that it’s been around for decades—if there were any truly bad side effects, common sense dictates that they would have been made known to the public by now. The downside to just throwing caution to the wind and buying it—after consulting your doctor, of course—is that the smallest bottle still has 50 pills, or 25 full doses. Other than that, there’s not much else. If you are not sensitive to large amounts of Melatonin and Magnesium, or are sensitive to Valerian Root and looking for an equally potent alternative, check out Source Naturals NightRest.